A government job website trumpeted by Esther McVey has been advertising roles for as little as £2 an hour. Just days ago the Tory Work and Pensions Secretary urged young people to use Find a Job to look for summer work in the school holidays. But it's now emerged the site carried a "disgraceful" ad for a sous chef with a healthcare firm in Coventry that claimed to pay £2 an hour. Other ads included for a hotel kitchen porter billed as £3.80 and up, and a part-time spa therapist billed as £4.05 an hour or more. The minimum wage starts at £4.20 for under-18s or £3.70 for apprentices. The ads - first revealed by The Times - have been taken down and a Department for Work and Pensions (DWP) official blamed "human error" on the part of the companies involved. Loopholes mean firms can offer accommodation or other benefits to get round minimum wage rules. However, DWP officials insisted the advertised rates were simply a mistake, no one would have been paid below minimum wage and firms must adhere to the law. Lib Dem leader Sir Vince Cable, a former Business Secretary, said: “It is disgraceful that these contracts exist, but it is all the more abhorrent that the Government has allowed them to be advertised on their own jobs website." 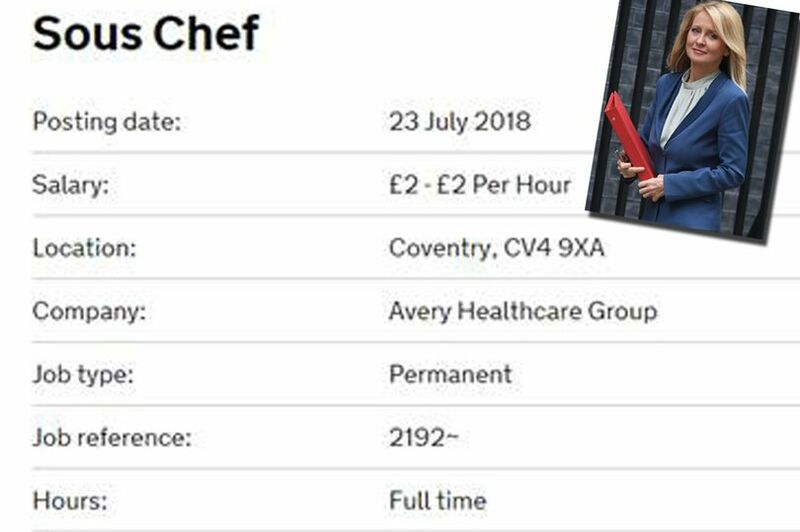 Avery Healthcare, which was listed as offering the £2-an-hour sous chef job, insisted it never listed the job as paying £2 an hour - instead describing the salary as "competitive". Other sous chef jobs with Avery are currently listed as paying £8.80, £9 and £9.10 per hour. A spokeswoman for the firm said: "we do not pay below minimum wage for any member of staff. "I am very unclear how the advert stated £2 per hour as it has not been posted on the Avery website or Indeed." Companies are approved by the DWP to post jobs on the website - but individual ads are not checked by the DWP before publication. A DWP spokesman said, given the volume of ads posted, the department was not able to check each one and human error could not be removed from any system. Officials also insisted none of the advertised jobs were aimed at young people, and none of them were summer work. TUC General Secretary Frances O’Grady said: "Ministers should be banning zero-hours contracts, not promoting them. “Too many hardworking young people are already getting stuck in low-paid and insecure work, with few opportunities to develop skills or get ahead. "So government needs to encourage in-work training, and crack down on bosses who exploit young workers." Shadow Work and Pensions Secretary Margaret Greenwood said: "It is disgraceful that the government's own website is being used to promote jobs that appear to be offering illegal rates of pay." A DWP spokesman said: "All employers must pay the national minimum wage and jobs listed on Find a Job must do the same. "We immediately removed these job adverts as soon as we were made aware. "We believe the salaries to have been listed incorrectly as an error by the employers and are contacting them urgently."